Summer will be here before you know it, which means it’s time to start planning your next Holland America Line cruise! While for some travelers summer may conjure up images of beaches and tropical islands, others may want to opt for a more unique destination. Typically considered for Fall Foliage cruises, our Canada/New England itineraries are a perfect option for an extraordinary summer vacation. Sailing from May through August, Maasdam and Veendam offer a selection of seven-, nine- or 14-day itineraries affording you the opportunity to choose the cruise that best fits your summer plans. From quaint towns with picturesque lighthouses to bustling cities rich with historical landmarks, elegant shops and fine dining, these ports of call are guaranteed to leave a lasting impression. Read below for a peek into some of the amazing destinations you’ll get to experience! Acadia National Park’s Bass Harbor Head Lighthouse. Bar Harbor is a scenic town full of inviting restaurants and charming boutiques ideal for a leisurely stroll. As you explore this quintessential coastal town, take time to indulge in Maine’s famously succulent lobster and top it off with dessert at one of the town’s homemade ice cream parlors – the perfect summer treat. 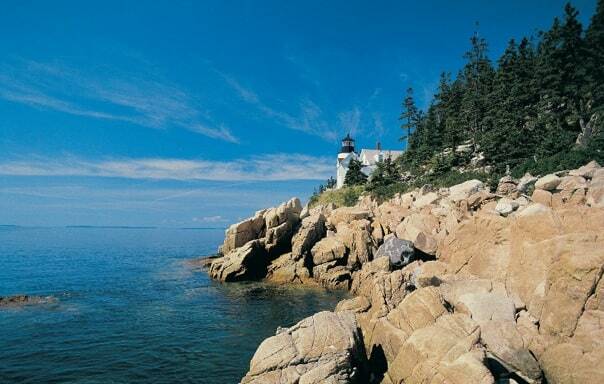 If sightseeing is on your agenda, plan to take part in our Bar Harbor Lighthouse Tour. Board a jet-powered catamaran and enjoy the refreshing breeze as you sail by Maine’s historic and alluring lighthouses that date back to the 1800s. For nature lovers, Acadia National Park is a major highlight of this port. If you’re looking to get active, you can choose to either hike or bike to explore its magnificent lakes and striking coastline. However, if you’re in the mood for a more laid-back experience, opt for a horse-and-carriage ride that allows you to relax as you take in the lush landscapes and natural wonders this park holds. 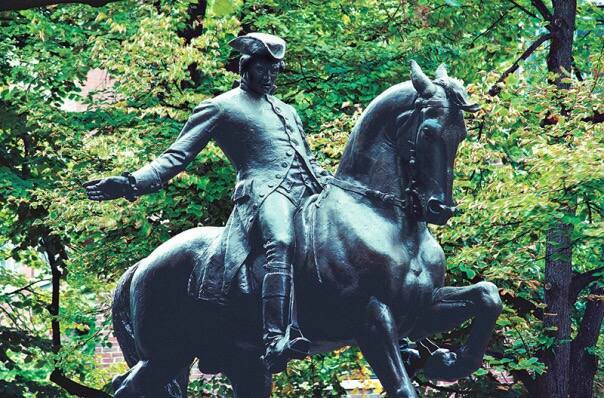 Paul Revere’s statue is one of the most photographed sculptures in Boston. Home to legendary figures of the America Revolution, Boston is a treasure for any history buff. Take a step back in time as you visit 16 historic sites on our Freedom Trail tour. Begin at the Boston Common Visitor Center and end at the Charlestown Navy Yard. Along the way, you’ll hit highlights like the Paul Revere House, Old North Church and the oldest warship still afloat, the USS Constitution. If you appreciate a more interactive experience, the Boston Tea Party Ships & Museum Tour won’t disappoint. With the help of live actors, high-tech exhibits and authentically restored tea ships, this floating museum transports you to the memorable night of Dec. 16, 1773. You’ll meet “colonists” and even get to reenact the historic event by dumping tea into the Boston Harbor. Sticking with the theme, top off your experience by visiting Abigail’s Tea Room for afternoon tea with scones, cakes and muffins. Traveling with kids? Make sure a visit to the Boston Common is on your itinerary. While this site packs some history too, it is also the perfect summer oasis. Whether you visit the ball fields or make a stop at Frog Pond to play in the spray pool, you can be sure it will be a fun-filled day for everyone! 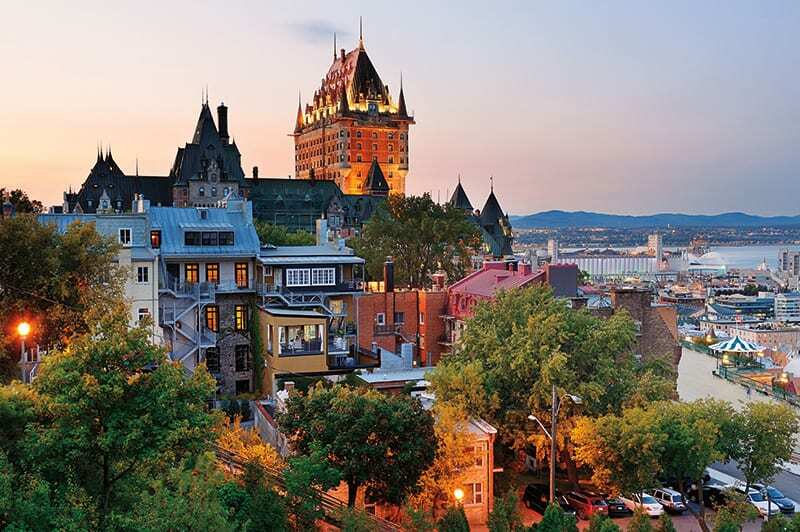 With its stone buildings & cobblestone streets you’ll quickly fall in love with Québec City’s European charm. Whether you’re exploring the city or its nearby attractions, you’ll find an extraordinary experience at every turn. Situated on the eastern edge of Québec City’s Upper Town, the Dufferin Terrace is famous for its remarkable views of the Lower Town and the St. Lawrence River, a sight you won’t want to miss. Before you make your way down to the Old Port on the funicular, be sure to make some time for tea or cocktails at Québec City’s most recognizable landmark, the castle-like Fairmont Le Château Frontenac. For something truly breathtaking, a visit to Montmorency Falls is a must! Serving as a popular subject among Québec painters, the falls rival Niagara with a cascade that’s a full 30 meters higher than that of Niagara’s — making it a spectacular sight to behold. Only a 30-minute drive from the city, Lac-Beauport is definitely a worthwhile stop. Located in the Laurentian Mountains, it’s the perfect place to hike, go for a dip in the lake and then recharge with lunch at one of the restaurants serving Québecois fare. 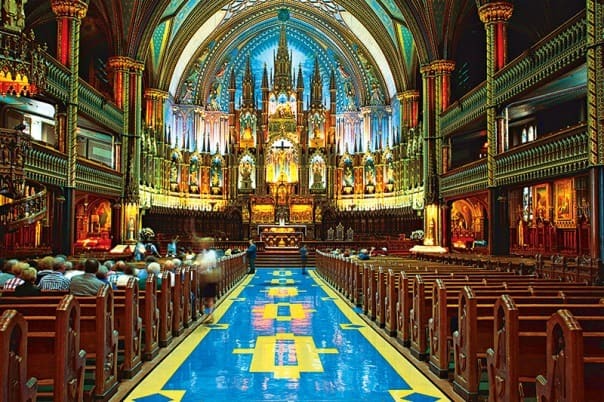 A visit to Montréal’s stunning Notre-Dame Basilica is a must. A classic mix of old and new, Montréal offers a little something for everyone. Known for being especially popular in the summer, a visit to Parc Jean-Drapeau is something you can’t pass up. 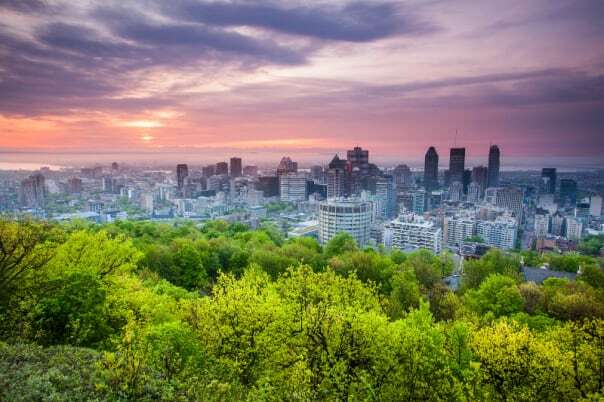 Along with being home to the city’s iconic landmark, the skeleton of the Montréal Biosphere, this green escape is known for its lively outdoor concerts and food vendors, making it an ideal place to spend a sunny afternoon. Visitors looking for a laid-back atmosphere should consider spending time at Place Jacques-Cartier. Enjoy the open air as you dine at one of the Parisian-style restaurants. After your meal, stroll through the square and catch a street performance, browse the works of various artists or even have your portrait painted for a unique souvenir. Also on your list should be Notre Dame Basilica, located in Old Montreal. This gorgeous High Gothic styled church built in the early 19th century is considered the spiritual and cultural heart for the city’s residents. If you love the idea of a Canada/New England cruise, but still crave that tropical vibe for your summer vacation, our 14-day Bermuda & Canada/New England Collectors’ Voyage is the perfect cruise for you. 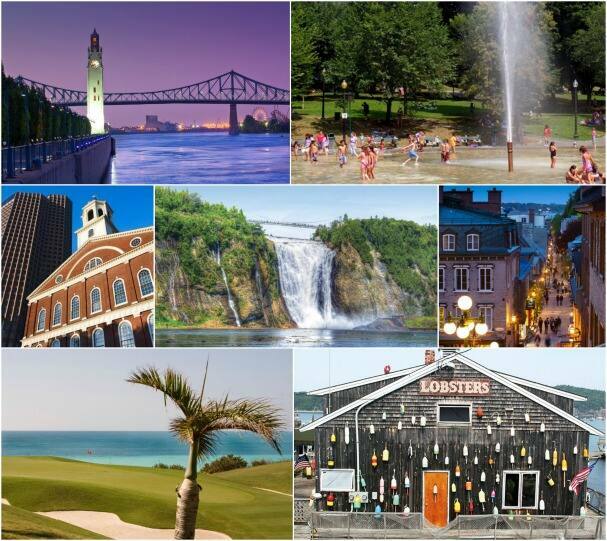 Hit all of the amazing ports a Canada and New England cruise has to offer, with the added bonus of a call at Hamilton. This particular sailing gives you three glorious days to swim, snorkel or simply soak up some rays on the island’s pink, powdery beaches. Looking to do more than lounge on the sand? You’ll find plenty of shopping, teahouses and pubs on bustling Front Street. Golf enthusiasts can choose to play at any of three championship seaside courses through our Journeys Ashore: Belmont Hills, Riddell’s Bay or Port Royal. While the Caribbean is always inviting, Canada and New England offer an alternate kind of paradise. Think outside the box this summer and take your travels in a new direction! What port would you most look forward to on a Canada/New England cruise? Tell us in the comments below!